“Will your anchor hold in the storms of life” I wonder just how many times we have all sung these words. Priscilla Jane Owens composed the hymn in 1882, the year before the BB was launched in Glasgow. Since then it has been sung at countless Brigade occasions over the years. A very prominent businessman once asked me why it was so often sung at the funeral of ex-members. He reflected that the Brigade must have had a real impact on their lives, he was of course totally correct and more importantly the BB is still changing lives today. The Brigade method is as relevant today as it ever was but as we enter a new year it is important to still focus on our object and the challenges ahead. The hymn is all about facing challenges, the reality is that very few of us are likely to have to steer a course through a storm at sea. However, I am aware that many BB families are facing difficult challenges in these modern times. There has been a considerable amount of press coverage recently about the millennials who often struggle to face the reality of modern life. Membership of the Brigade is proven to develop life skills and we know that our programme gives our members the ability to face up to a challenge and build the resilience needed to get you through the daily grind. Just speak to any Queen’s Badge recipient or young person who has just completed DofE Gold and you will hear how they relished the challenge of gaining these awards. 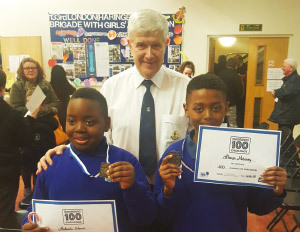 Juniors in the 133rd London and 2nd Haringey were congratulated recently on being the first to complete all the Juniors 100 Challenges – so it is not only our older members who face challenges. It was interesting to hear that they thought the challenges were pitched just right. A couple were easy, a few were tricky and some were really difficult. 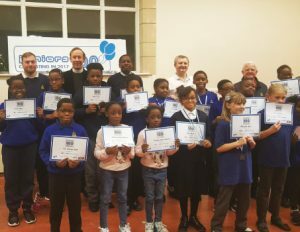 The challenges have proved a great success, they have been fun, they have helped us raise our profile, improve programmes and gain some new members. As we continue our journey, it is self-evident that the Brigade still faces many challenges. Perhaps we too are facing a storm as we try to wrestle with declining numbers, balancing the budget, new governance models, the increasing demands of external regulators and a more secular society. It is not easy and we need to be realistic as we plan for the future. Many of our structures designed in the Victorian era are creaking in the 21st century. No doubt difficult decisions will need to be made in the months ahead and I would ask you to keep the Brigade Executive and the staff team in your prayers as we try to find the best course for the future. However, the hymn that means so much to us reminds us that faith will see us through such difficulties. The Good News of the Gospel has survived 2000 years of storms and tribulations – Our Lord’s message still needs to be preached and we owe it to the young people in society to do our best to share it with them.